Offer condition: *An extra 10% off at WHSmith.co.uk with no minimum spend - offer ends at 23.59 Wednesday 24th April 2019. Offer valid online only. To qualify for this offer, add your products to your basket and enter promotion code APRIL10. The 10% discount will show in the basket and is only valid once per transaction. The following products are excluded from this offer: Magazine subscriptions, gift cards, tokens & vouchers, Royal Mail postage stamps, Kobo eReaders, eBooks and all partner/3rd party products. Offer subject to availability. No cash alternative. Cannot be used in conjunction with any other online promotion codes. Offer condition: T&C's Offer valid online only. To qualify for this offer, add your products to your basket and enter promotion code HAPPY. The £5 discount will show in the basket and is only valid once per transaction. The following products are excluded from this offer: Magazine subscriptions, gift cards, tokens & vouchers, Royal Mail postage stamps, Kobo eReaders, eBooks and all partner/3rd party products. Offer subject to availability. No cash alternative. Cannot be used in conjunction with any other online promotion codes. Do not miss another WHSmith voucher! Simply leave your e-mail address and we'll always keep you informed of new vouchers for WHSmith. 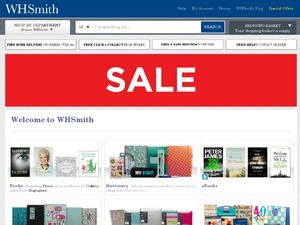 Offer condition: *An extra 10% off Clearance at WHSmith.co.uk - offer ends at 23.59 on 25th March 2019. Offer valid online only. To qualify for this offer, add your products to your basket and enter promotion code CLEAR10. The 10% discount will show in the basket and is only valid once per transaction. This promo code offer only applies to products that are listed in our Clearance department. Offer subject to availability. No cash alternative. Cannot be used in conjunction with any other online promotion codes. Offer condition: Offer ends at 23.59 Thursday 14th February 2019. Offer valid online only. To qualify for this offer, add your products to your basket and enter promotion code LOVE19. The £5 discount will show in the basket and is only valid once per transaction. The following products are excluded from this offer: Magazine subscriptions, gift cards, tokens & vouchers, Royal Mail postage stamps, Kobo eReaders, eBooks and all partner/3rd party products. Offer subject to availability. No cash alternative. Cannot be used in conjunction with any other online promotion codes. When you buy 3 or more at WHSmith.co.uk Treat yourself to more great books this January with our special promo code. Simply add promo code BOOK10 to your basket. Offer condition: An extra 10% Off Books when you buy 3 or more at WHSmith.co.uk - offer ends at 23.59 Wednesday 30th January 2019. Offer valid online only. To qualify for this offer, add 3 books to your basket and enter promotion code BOOK10. The 10% discount will show in the basket and is only valid once per transaction. Only products in the Books category qualify for the offer. Offer subject to availability. No cash alternative. Cannot be used in conjunction with any other online promotion codes. Offer condition: Save £5 when you spend £30 or more at WHSmith.co.uk - offer ends at 23.59 Wednesday 16th January 2019. Offer valid online only. To qualify for this offer, add your products to your basket and enter promotion code NEWYEAR. The £5 discount will show in the basket and is only valid once per transaction. The following products are excluded from this offer: Magazine subscriptions, gift cards, tokens & vouchers, Royal Mail postage stamps, Kobo eReaders, eBooks and all partner/3rd party products. Offer subject to availability. No cash alternative. Cannot be used in conjunction with any other online promotion codes. Extra 10% discount on Clearance - use promo code CLEAROUT10 for 1 week only! Offer condition: An extra 10% off Clearance at WHSmith.co.uk - offer ends at 23.59 on 24th September 2018. Offer valid online only. To qualify for this offer, add your products to your basket and enter promotion code CLEAROUT10. The 10% discount will show in the basket and is only valid once per transaction. This promo code offer only applies to products that are listed in our Clearance department. Offer subject to availability. No cash alternative. Cannot be used in conjunction with any other online promotion codes. Offer condition: Includes ALL Stationery, Art & Craft and Toys & Games. Exclusions apply, for full terms and conditions please see below. -Offer valid on purchases made between Monday 23rd July and Monday 17th September 2018 -To redeem this voucher online enter code ONLINE5 in the checkout at whsmith.co.uk. One promo code per transaction. - The £20 spend level is the total order value excluding delivery charges and after all other discounts have been applied. Cannot be used in conjunction with any other online promo codes. -The following products are excluded from this offer: Books, gift cards, tokens & vouchers, magazine subscriptions, Royal Mail postage stamps, Kobo eReaders, eBooks and all partner/3rd party products. Offer subject to availability. No cash alternative. Cannot be used in conjunction with any other online promotion codes. Offer condition: Offer valid online only. To qualify for this offer, add your products to your basket and enter promotion code school20. The £5 discount will show in the basket and is only valid once per transaction.The £20 spend level is the total order value excluding delivery charges and after all other discounts have been applied. The following products are excluded from this offer: gift cards, tokens & vouchers, magazine subscriptions, Royal Mail postage stamps, Kobo eReaders, eBooks and all partner/3rd party products. Offer subject to availability. No cash alternative. Cannot be used in conjunction with any other online promotion codes. Offer condition: *£5 off when you spend *£25 or more at WHSmith.co.uk - offer ends at 23.59 on Monday 25th June 2018. Offer valid online only. To qualify for this offer, add your products to your basket and enter promotion code KICKOFF. The £25 spend level is the total order value excluding delivery charges and after all other discounts have been applied. *£5 discount will show in the basket and is only valid once per transaction. The following products are excluded from this offer: gift cards, tokens & vouchers, magazine subscriptions, Royal Mail postage stamps, Kobo eReaders, eBooks and all partner/3rd party products. Offer subject to availability. No cash alternative. Cannot be used in conjunction with any other online promotion codes. Offer condition: *£5 off when you spend £25 or more at WHSmith.co.uk - offer ends at 23.59 on Sunday 20th May 2018. Offer valid online only. To qualify for this offer, add your products to your basket and enter promotion code ROYAL5. The £25 spend level is the total order value excluding delivery charges and after all other discounts have been applied. £5 discount will show in the basket and is only valid once per transaction. The following products are excluded from this offer: gift cards, tokens & vouchers, magazine subscriptions, Royal Mail postage stamps, Kobo eReaders, eBooks and all partner/3rd party products. Offer subject to availability. No cash alternative. Cannot be used in conjunction with any other online promotion codes. Offer condition: *£5 off when you spend £25 or more at WHSmith.co.uk - offer ends at 23.59 on Wednesday 11th October 2017 -Offer valid online only. -To qualify for this offer, add your products to your basket and enter promotion code FRESHERS25. The £25 spend level is the total order value excluding delivery charges and after all other discounts have been applied. -£5 discount will show in the basket and is only valid once per transaction. -The following products are excluded from this offer: gift cards, tokens & vouchers, magazine subscriptions, Royal Mail postage stamps, Kobo eReaders, eBooks and all partner/3rd party products. -Offer subject to availability. -No cash alternative. -Cannot be used in conjunction with any other online promotion codes. Offer condition: Extra 10% off when you spend £20 or more at WHSmith.co.uk - offer ends at 23.59 on Monday 3rd April 2017. Offer valid online only. To qualify for this offer, add your products to your basket and enter promotion code SPRING10. The £20 spend level is the total order value excluding delivery charges and after all other discounts have been applied. 10% discount will show in the basket and is only valid once per transaction. The following products are excluded from this offer: gift cards, tokens & vouchers, magazine subscriptions, Royal Mail postage stamps, Kobo eReaders and eBooks. Offer subject to availability. No cash alternative. Cannot be used in conjunction with any other online promotion codes.